Thinking of starting a collection of useful power tools? Or maybe, are you contemplating of becoming a DIY enthusiast? Clueless about what piece of equipment you should purchase first? While the possibilities can be endless, one that you might want is a belt sander, which many people consider as the gorilla of the sanding world. In the rest of this guide, I will help you to pick from the best belt sanders that you can find in the market. The options are limitless, but this does not go to show that you can choose whatever is the cheapest or the first product that you find. By being an intelligent buyer, there is an assurance that you will find one that delivers superior functionality and performance. Sanders can be confusing, especially if you are buying one for the first time. For the uninitiated buyer, the abundance of the options that are available in the marketplace will easily lead to confusion. Among others, belt sanders are some of the most common that you will find. There are many types of belt sanders and you need to look for one based on the task that you need to complete. There are best belt sanders for knife making and woodworking, among other tasks. They work in various ways. In a nutshell, a belt sander is a useful tool in the rapid removal of wood. This is unlike in the case of most sanders made for finishing projects. If you need to smoothen a surface, such as wood, a belt sander does the first step. The next steps will require either a random orbital sander or a palm sander. What are the Types of Belt Sanders? Stationary Belt Sander: Also called benchtop belt sander, these are huge ones and are attached to a bench. This is meant for large-scale applications and professional jobs. It is more expensive, but it is more efficient in the long-term. 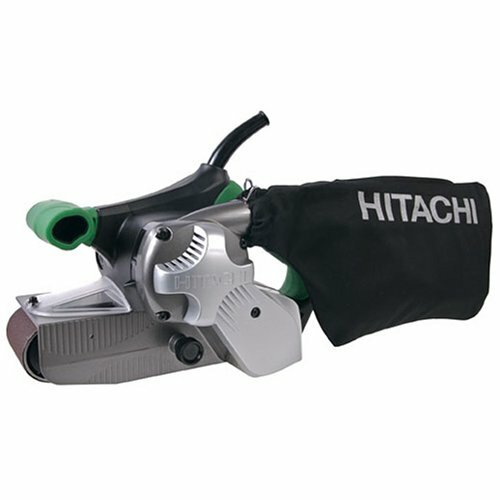 Hand-held Belt Sander: If you need one that is lightweight and compact, which is ideal for small-scale jobs, this is the right belt sander for you. It is a common choice for many novices. 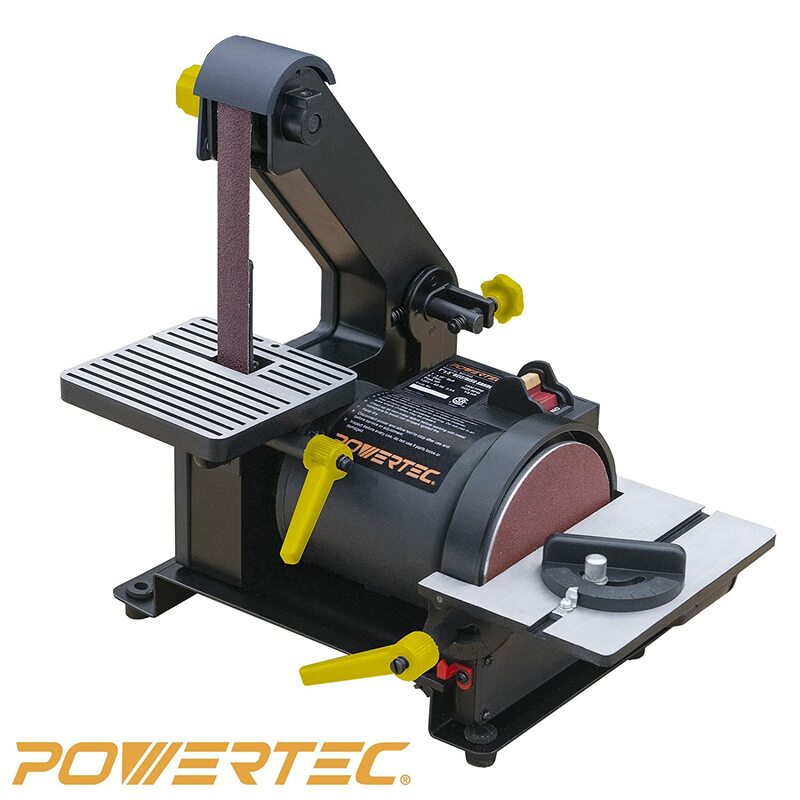 If there is a need to, you can even transform your portable belt sander into one that is bench-mounted. What are the Benefits of a Belt Sander? Easy to Use: Compared to other types, the use of a belt sander is pretty much straightforward and nothing that is too much to handle for a beginner. You will need to exert minimal effort as there is no need for a lot of tilting and pressure. Works Quickly: Another good thing about using a belt sander is the fact that you do not need to have the luxury of time. It performs an aggressive action, allowing it to quickly sand a lot in no time. Multi-functional: This is perhaps the best thing about belt sanders. They can be used in more ways than one, such as refinishing metal and wood, fixing a problematic door, making a knife, removal of stain from wood, and old furniture renovation. Below are five of the products that are worth taking a look at. To make it easier to pick one, Home Okatu will identify some of their top features, as well as a few of their pros and cons. Makita is a name that is synonymous with powerful and high-quality tools, making this one of my top choices within the product category. It is a 3x21-inch sander, making it a lightweight and portable choice. This is perfect even if you frequently sand outside of your home. The sander comes with an 8.8-amp motor, which is powerful enough to tackle different DIY tasks without requiring too much on your end. To make it even more comfortable to use, it produces only 85dB of noise, making it quieter than most of its counterparts. Its low-profile design is one more thing that is worth mentioning. With the latter, it is well-balanced and easy to hold. To add, there is also an extended base. For better depth control, you can also use a sanding shoe, although the latter is an accessory that you must purchase separately. As one of the best belt sanders for woodworking, this is an exceptional product because of the variable speed control dial, allowing you to adjust its performance based on what the task requires. You can adjust the speed from 690 to 1,440-foot per minute. Lastly, to provide you with peace of mind, the manufacturer is offering a 30-day refund if you are unhappy in any way with how this belt sander performs. There is also a one-year warranty. Equipped with a 9-amp motor, this is one of the best belt sanders that can deliver impressive performance in different tasks. You will love how it comes with an adjustable speed, which you can set anywhere from 820 to 1,475-foot per minute. In terms of comfort, you won’t go wrong with this product as well. It is equipped with a grip surface that is made from soft elastomer, which will allow you to easily hold the unit. Nonetheless, there are some instances wherein you might find yourself easily losing balance. It is also worth noting that it comes with V-belt drives that are water-resistant. This prevents the internal components from being wet. The end result is that it offers better wear resistance, making it useful even through the years. If the components ever get damaged, you do not need to immediately get rid of the entire belt sander. The manufacturer makes sure that there are replacement parts that are easily available. The clear front window is an intelligent design feature that makes it better. This will provide you with a clear vision of the surface where you are working. You will easily steer the sander in the direction that you intend to and will result in a better consistency. This belt sander is equipped with a 1/3 HP motor. This is less powerful than most of the higher end options that you can find in the market. Nonetheless, it will be suitable for most hobbyists who expect to do small-scale tasks. Especially considering its price point, this is another option worth considering. It is also impressive since it is built with dual dust ports. The latter enables the unit to have better dust collection. The outcome is that the work area will be a lot cleaner, as against others that can create a lot of mess. For better precision when sanding, the work table of this product can be adjusted from 0 to 45 degrees. This will allow you to set the miter gauge based on the position of the table that is best for the task. When changing the sanding belt, there is no need to struggle. It is designed to be user-friendly. Nonetheless, it should also be pointed out that there are some adjustments that can be quite tricky to do on the first time of use. 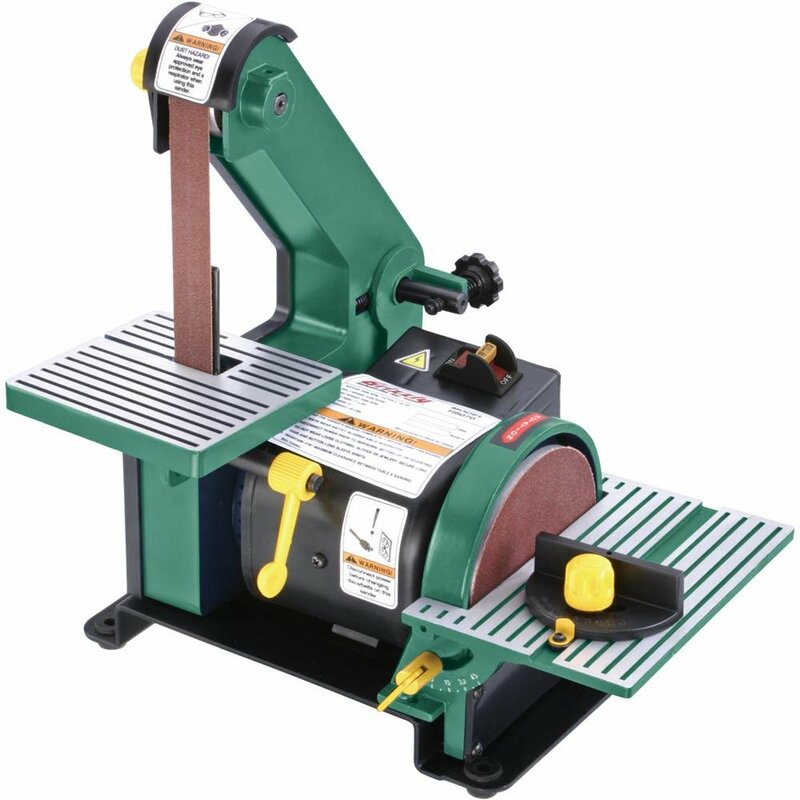 Looking for a belt sander that you can use at home for light-duty tasks? This is one option that should be part of your list of choices. The 1/3 HP motor may seem to be too little for some, but in fact, for most common projects, it has more power than what will be necessary. In terms of portability, you will also find this product to be impressive. It has a width of one inch and length of 30 inches. This five-inch belt sander will offer optimal portability, which makes it perfect for projects that you must complete outdoors. For versatility, you can tilt the table of this belt sander up to 45 degrees so that you can customize its sanding position. There are also two dust ports in the belt sander for optimal dust collection. This means that you do not have to worry a lot about the mess that it can create within the work area. Lastly, it has a motor with a speed of 3,450 RPM. One thing that initially held me back from this product is the fact that the speed is non-adjustable. Nonetheless, for many beginners, this should not be too much of a concern. Your search for the best belt sanders under $100 stops the moment you find this product. 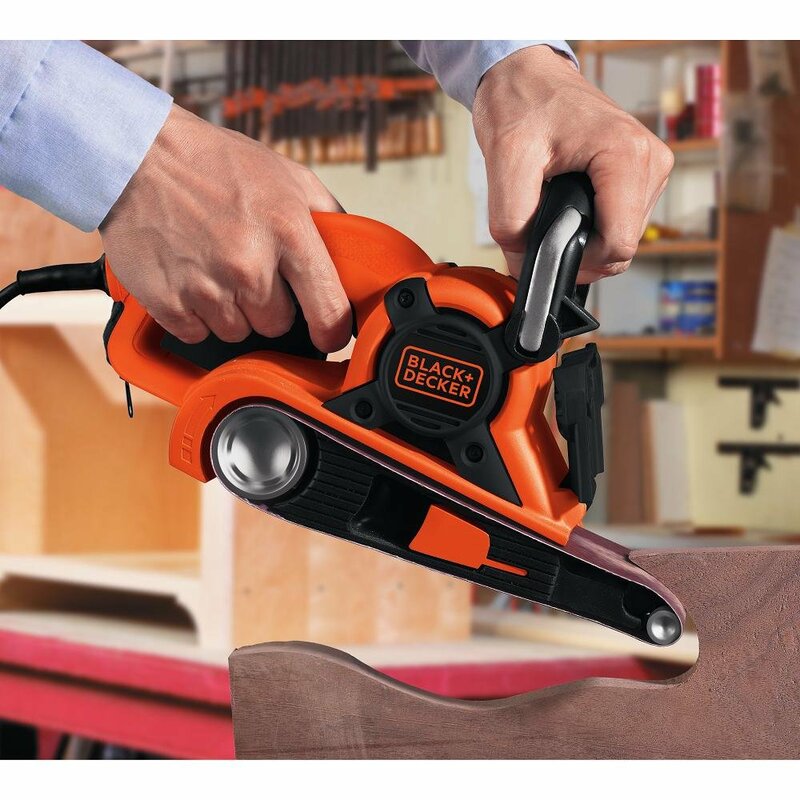 More than the budget-friendly price, it is made by Black & Decker, which is one of the most reputable brands in the global market for power tools. The 6-amp motor of the unit guarantees the best sanding outcomes in many tasks. 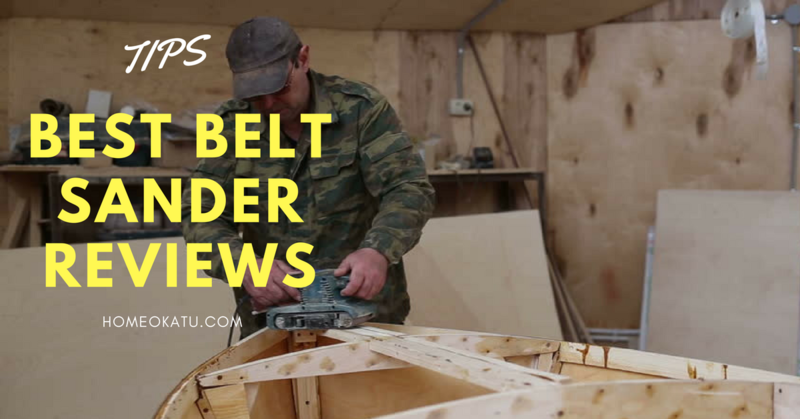 If you are into home improvements and DIY tasks, among other things that require a belt sander, you will love how its motor is capable of delivering optimal results. For your comfort, it is designed with your needs in mind. One that I personally love is the compact body and low-profile design. Even when sanding in low spaces, this will be exceptional. You will also not feel too much fatigue, even when it is used for an extended period of time. There is also a conveniently located belt release lever. With this, you will be able to remove and replace the sandpaper easily. Reviews: Similar to buying any other product, a good starting point would be the feedbacks from other people. It would be wise to use their real-life experiences and opinions to weigh down the possibilities. Go online and look for belt sanders reviews to make a well-informed choice. Size: To determine which size is best for your needs, you need to think about the project where you will use the belt sander. The large ones are usually for professional contractors working on big projects. Ease of Use: There are many things that can contribute to a belt sander being user-friendly. Among others, one of the most important is that the manner of changing the paper should be as effortless as possible. It should also be easy to hold and must not lose balance. Portability: If you are a DIY enthusiast, choose a lightweight and compact belt sander. This means that you can bring and use it anywhere. To add, this also means that it will not result in too much fatigue as it will be easier to handle. Comfort: If they weigh more than what you can handle, you will end up being uncomfortable. With this, choose one that is lightweight enough so that even after several hours of work, you will still feel comfortable. Variable Speed: Most of the older models have a single speed. If you want one that is more versatile, you need to pick a model that comes with an adjustable speed that can be easily customized through a dial that is strategically-positioned. Care and Maintenance: It is essential that you exert effort to preserve the quality and functionality of the belt sander. See to it that the product will not be too demanding in terms of the care that it needs to retain its best performance. Dust Collector: When you are sanding, dust can be produced and can contribute to the mess in the work area. Look for a belt sander that has an impressive dust collector, which often comes in the form of dust bag or canister. Warranty: Belt sanders are not free from problems. There can be an issue with its motor or some of its parts. If the product comes with a longer warranty coverage, this means that you can be confident that the manufacturer or seller will stand by the quality of their product. Wear a dust mask when you are working. It will also be a good idea to have goggles to protect the eyes. Even if there is a dust collector, you need to protect yourself. When it is time to change the sandpaper, make sure to take off the plug. Having no electrical current means that you can work on it safely. Keep moving the belt sander when sanding, preferably in a uniform direction. If you work on a single part of the material for a time that is longer than necessary, you might end up creating a hole, especially when you are working on wood. Choose the right sandpaper. They are available in different grit sizes. Choose grits that will be appropriate for the task that you have in mind. A coarser sandpaper should be used for heavy applications. Pay attention to the amount of dust that has been collected. Ideally, you must empty the bag once it reaches ¼. It can be a threat of fire. To add, you also need to make sure that you are working in an area that has proper ventilation. In sum, if you are looking for the best belt sanders that are available in the market, Makita 9903 stands out from the rest. Compared to the other four, it can deliver exceptional power without compromise. From its ergonomic design to its silent performance, it is indeed an option that can provide the best bang for the buck. Convenient and easy to use – these are just two of the things that make battery-powered weed eaters a good investment for a gardening equipment. They are lightweight, and hence, won’t require too much effort on your end. Some might be worried that their batteries won’t last long. With the latest technologies, this is no longer the case. A lot of batteries are lightweight without compromising their power. 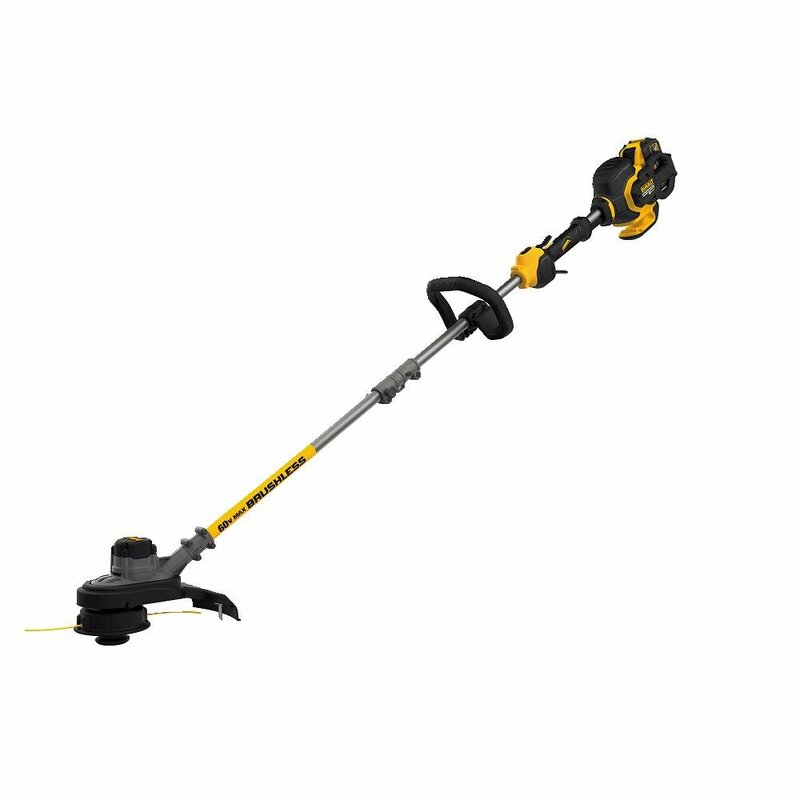 · Portable: One of the best things about this type of string trimmer is that it is portable. You can use and bring it anywhere because it is cordless. · Lightweight: Most models that fall under this category are known for keeping their weight at a minimum, making them easy and comfortable to use. · Quiet: Compared to their gas-powered counterparts, those that are equipped with a battery tends to be quieter even when they are delivering a powerful performance. · Easy to Maintain: It does not require a lot of effort in terms of care and maintenance unlike those that are gas-powered. 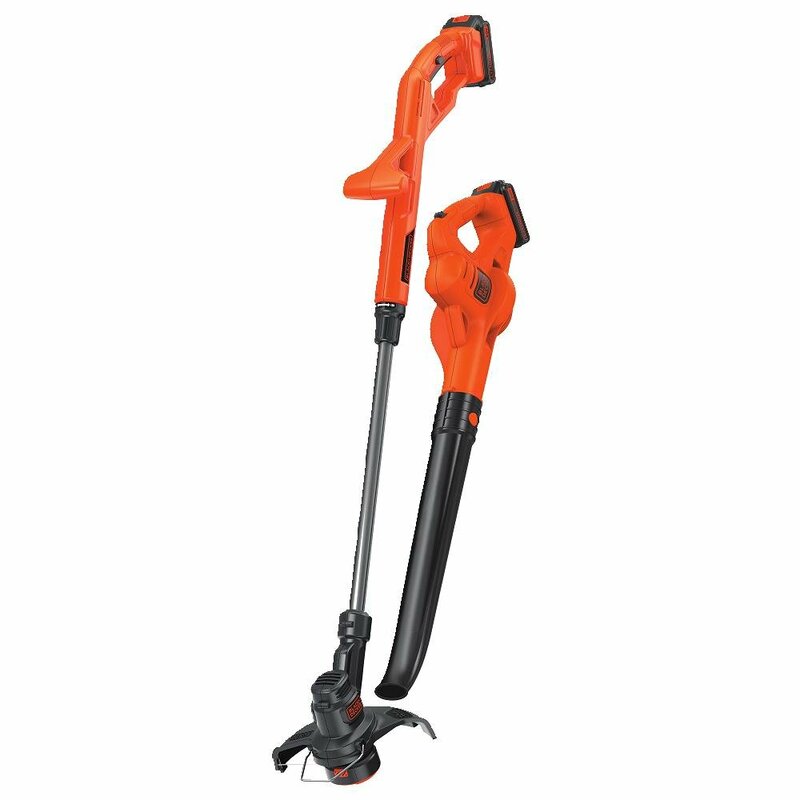 · Easy to Use: There is no need for priming or for pulling a cord to start a battery-powered weed eater. Often, all it takes is a push of a single button for it to start. · Good for the Environment: Again, this is a benefit that makes it better than those that are gas-powered. They do not produce emissions that can harm the environment. A good way to classify the weed eaters available on the market would be on the basis of the batteries that they use. For the cheap models, they usually run on a nickel-cadmium battery. It is rugged and has a high-cycle, provided that it is properly maintained. However, one thing that a lot of people do not like about this battery is that they are heavy and can experience a significant reduction in performance over time. The more popular models are equipped with a lithium-ion battery. They are known for being energetic, making it a popular choice in electronics. It is also lightweight, so this is going to make the weed eater more comfortable to use. The power output is not reduced over time, even if it has been through several recharges already. Below are some of the top products that should be on your radar, as well as the reasons why we love them. The brand name itself can already provide you with a good reason to choose this product over most of its competitors. It is powered by a lithium-ion battery that can also be used with other gardening tools from the company. 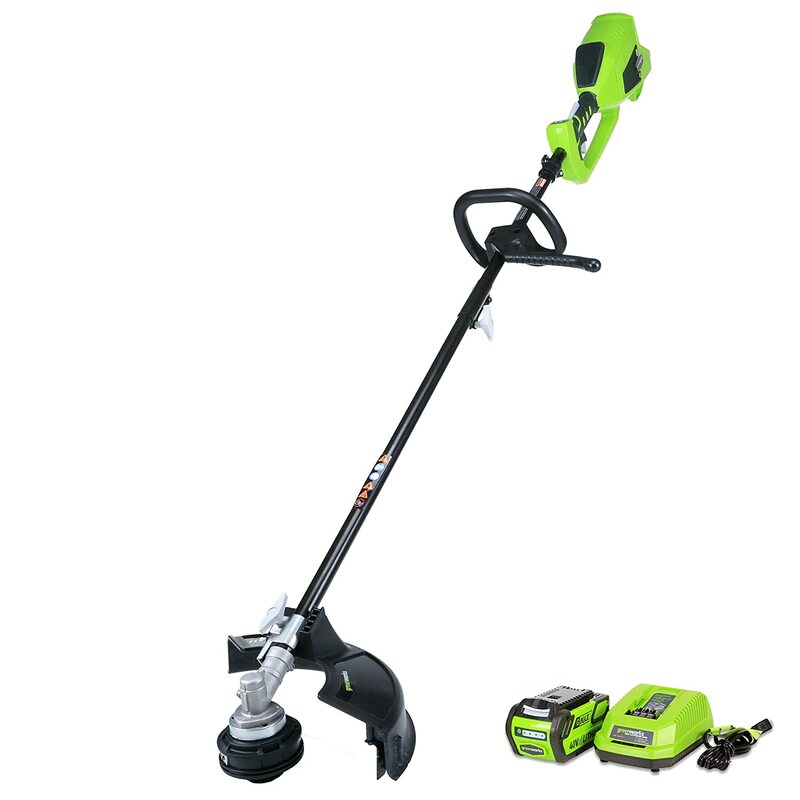 One of the best features of this cordless string trimmer is the automatic line feed spool. Basically, the latter will allow you to save a lot of time when working in the garden. Because of this feature, you won’t have to make manual adjustments in the spool. For your convenience, the height and the handle can be adjusted based on what you are most comfortable with. Regardless if you are short or tall, you can customize it as desired. The Power Drive Transmission is another notable innovation that you will find in this product. This will provide better cutting power to the strings compared to the transmission in the older models from the same company. It comes with a command dial, making it easy for you to adjust the speed as desired. You will have the freedom to choose from 6,500 or 8,500 RPM depending on the requirements of a specific task. Lastly, for your peace of mind, it is also good to know that the manufacturer is offering a warranty that lasts for three years. It comes with a 12-inch cutting diameter, which will allow you to do more in a short span of time. The cutting line length, on the other hand, is 10 inches. As for the battery, the unit is powered by a 32-volt Max Lithium battery. It has a decent runtime and power. On average, it takes three hours to have the battery fully charged. Another feature that you will love in this product is the adjustable spacer guard. Basically, this will protect plants from potential damage while being able to deliver an effective trimming job. The manufacturer is offering a 3-year warranty. More so, if you are unhappy within the first 30 days of its use, you can return it to the manufacturer, and they will issue an unconditional refund. Lastly, the manufacturer promises to provide free spool for life! All that you have to do is to handle the shipping costs! Even if this is a battery-powered model, a lot of its users were happy with the powerful trimming performance that it can deliver. In fact, many of its users note that the power is comparable to those that are equipped with a gas engine. The brushless motor is one of the best features you will find in this product. More than the improved torque, the motor is also known for operating quietly. Plus, it helps to make the battery last longer. You will also love the versatility of this product. It can provide excellent value for the money since you can use it in more ways than one. 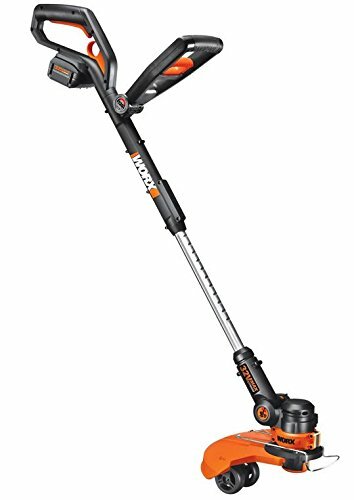 It is attachment capable, so you can connect compatible accessories to use it more than just as a weed eater. However, there are some people who noted that the bump feed line can be an issue. If you are looking for a battery-powered weed eater that is easy to use, it will be better to choose a model that comes with an auto feed line. If you are looking for a budget-friendly alternative, this is one product that should be on your radar. Even if it is cheap, there is no need to worry about its quality, especially because it is made by a globally trusted brand. You will also love the fact that it comes as a combo kit. There is a bonus sweeper, which will be handy in cleaning driveways and decks, among others. This can also prove to be an exceptional choice when it comes to the comfort that it can deliver to its users. It is lightweight, so you can expect that this won’t easily lead to fatigue. The unit is powered by a 20V Max Lithium-ion battery. If you find this to be not powerful for your needs, you can upgrade to a 40V battery. However, do not expect too much in terms of its performance. To avoid being disappointed, take note of the fact that it is designed only for light-duty tasks. The mere fact that it is made by Dewalt can easily convince you to choose this over many others. It is powered by a 60V battery, which is one of the most powerful from the products that we have listed in this short guide. One more thing that makes this an impressive product is the 15-inch cutting swath, which will allow you to do more in a short span of time. Despite this, however, take note that is suitable only for light-duty applications. The price can be an overkill for some people, but this is not a thing that you have to worry about. It can provide excellent value for every dollar you will be spending. It is user-friendly and comes with an ergonomic design. The unit is also lightweight, so you won’t easily feel tired. While you might be overwhelmed with the long list of the brands and models available, this should not be an excuse for you to decide in haste. To help you narrow down the possibilities, below are some of the most important factors to take into consideration. · Shaft: There are two types of shafts that you can find in most string trimmers – straight and curved. Curved shafts are best if you are working on an open lawn. Straight shaft, on the other hand, tends to be the better option if you are working in tight spaces. · Weight: The best option is one that is lightweight and well-balanced. See to it that the battery and the other components of the weed eater won’t add significant weight to the unit, which is important to ensure your highest level of comfort. · Power Output: This is one of the most important technical specifications to take into account. This will have a direct impact on the overall performance of the string trimmer. More than the power, take into account how long the battery will last and how long it needs to be recharged. 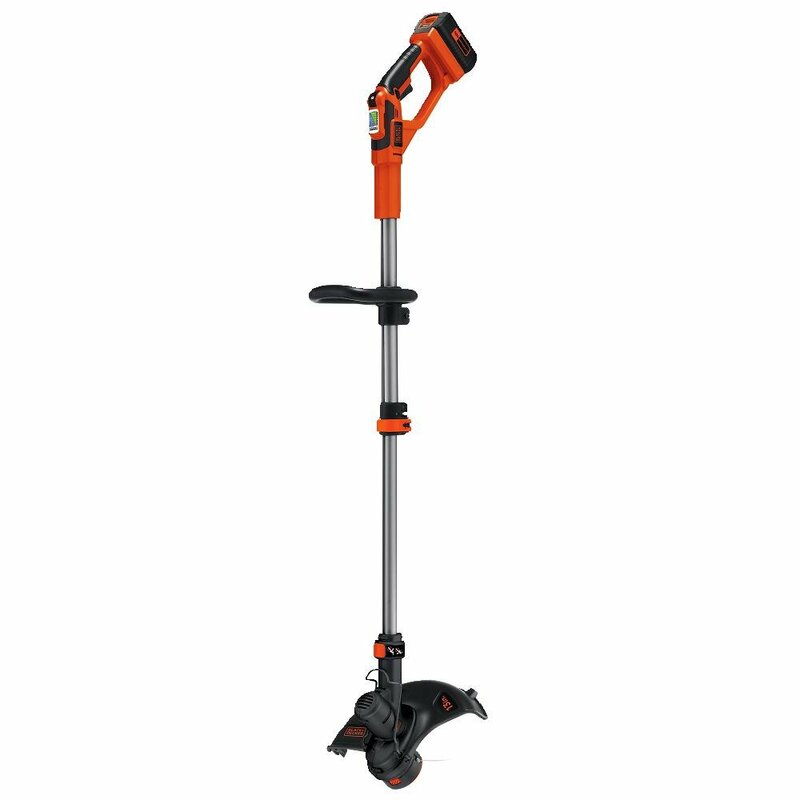 · Ergonomics: More than just the weight, an ergonomic string trimmer is one that comes with a well-designed handle that will be easy for you to hold. It should also produce minimal vibration to make you comfortable as you work. · Noise: Generally, battery-powered weed eaters are quiet when they operate. Nonetheless, there are still some products that can produce an annoying noise, which can affect your comfort. · Pay attention to the condition of the lawn before you start. It should be dry. When the grass is wet, there is a higher likelihood that they will get stuck and can also speed the wear of your weed eater. · Work on the same place twice. This might seem like counter-intuitive, especially for those who are lazy, but this will provide an assurance that you will have a well-manicured lawn. Remember, you won’t be able to cut everything on a single pass, so it might be necessary to do a second pass. · Before storage, make sure to clean the unit, especially the trimming head. Get rid of the excess trimmings that are stuck. They will be more difficult to remove when they already harden. · When storing the unit, it will be best to take out the battery. Keep it neatly stored in a place away from direct heat.